While the BMW X5 isn’t as capable off road as a Range Rover or Land Rover Discovery, on the road it offers very few compromises – only the Porsche Cayenne can rival it for handling or performance. When BMW launched the original X5 in 1999 it was its first ever SUV. Using technology from Land Rover (as the British firm’s then owner) it was capable and exceedingly popular – some would say it kick-started the luxury SUV sector for the new millennium. So although the second generation, arriving in 2006, didn’t look much different, it continued with the previous car’s sales success. The result being there are now plenty to choose from on the used market. There’s not much of an engine choice with the second generation X5: two diesel and two petrol and virtually nobody in Ireland chose a petrol model. The 408hp 4.8-litre V8 petrol engine offers mighty performance, but tempers this with 12.5 litres/100km fuel consumption and emits 292g/km of CO2. However, if running costs bear no significance, the X5 M is the ultimate performance SUV, with a 4.4-litre V8 twin-turbo and 555hp, the 0-100km/h dash is completed in only 4.7 seconds. Regardless, the diesels are fine units and the 3.0-litre straight-six uses just 7.4 litres/100km while offering keen performance and impressive refinement. However, those who need a little more get up and go should look to the 3.0-litre twin-turbo diesel with an extra 62hp but broadly similar economy and CO2 figures. This model is called the xDrive40d. The latter was only introduced in 2010 though, when the facelift also brought new bumpers, lights and an updated interior. Only automatic gearboxes are offered, which are excellent, and the facelift heralded the fitment of an eight-speed unit which is even better. Unlike the firm’s X1 model, all X5’s come with four-wheel drive as standard and buyers can choose from SE or M Sport trim levels. 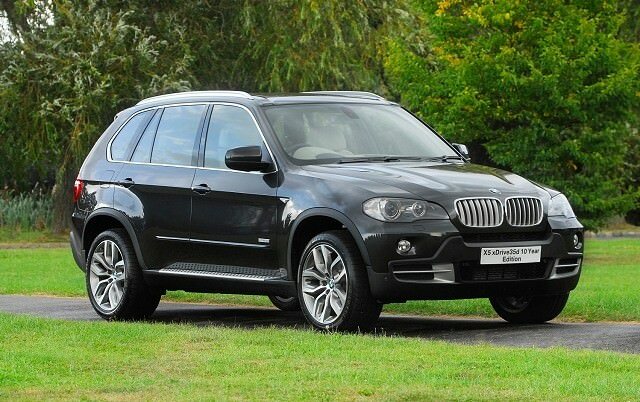 Unless you’re an oil baron, the BMW X5 makes the most sense when fitted with a diesel engine, and though the twin-turbo unit in the xDrive40d has few compromises it was only introduced in 2010 so remains rare on the used market. Instead, opt for the single turbo 3.0-litre straight-six, and stick with the SE model. M Sport trim may look flashier, but the smaller wheels and softer suspension on the SE makes for a better compromise between ride and handling. While the BMW X5 isn’t as capable off road as a Range Rover or Land Rover Discovery, on the road it offers very few compromises – only the Porsche Cayenne can rival it for handling or performance. And despite the school-run image, the X5 benefits from a strong and loyal following, while the latest diesel models are some of the most efficient available.